METRIS C3 H Modelleri , özellikle büyük ve geniş boyutlardaki parçaların ve kalıpların kalite kontrolünde kullanılmaktadır.Tek kollu ve çift kollu konfigürasyonlar ile kullanılmaktadır. Tablaya montaj edilebildiği gibi raylı bir kızak sistemi ile montaj edilip kullanılabilmektedir. X Ekseni çelik kızak yollu ve hassa masuralı tip rulmanlıdır. The SWAN SI series of table mounted (Console) Horizontal Arm CMMs offers a technically advanced and cost effective solution for the dimensional inspection of thin-walled sheet-metal and plastic components typical in the automotive industry. SWAN SI CMMs feature air-bearings on both the Y- and the Z-axes providing a high performance, high accuracy solution. 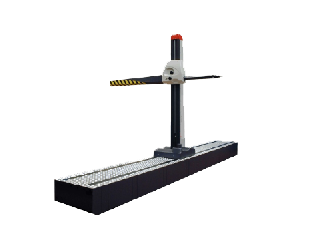 The X-axis guide-way is located on the side of the cast iron or granite support table. SWAN SI can be installed on a pneumatic vibration isolation system for deployment in production applications, without the need for a dedicated machine foundation. 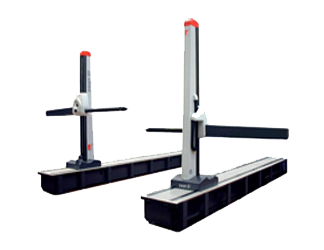 The COORD3 SWAN DUAL ARM series of table (Console) and rail mounted (Runway) horizontal arm coordinate measuring machines offer a technically advanced and cost effective solution for automotive car body-in-white and sub-assemblies. The rail model allows the full machine to be installed flush with the factory floor with walk-able way covers. The SWAN Dual Arm is unique in offering air bearings to both Y and Z axis providing a high performance high accuracy solution. Each horizontal arm measuring volume overlaps by 100mm allowing for full cross-body measurements. 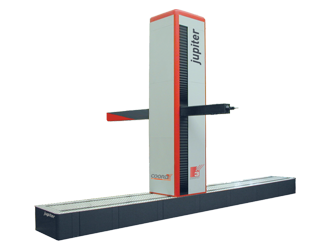 The JUPITER CMM is a proven high performance CMM for direct use in production. It paces manufacturing and was specifically developed for automotive body-in-white and subassembly inspection applications. JUPITER is a Runway design and available in single or dual arm configurations. It is fully encapsulated to provide thermal isolation from environmental changes and includes protection from shop-floor contamination. 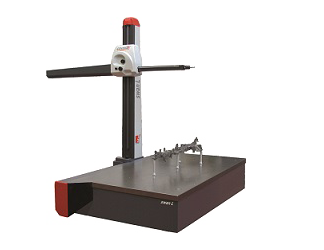 High dynamics and superior accuracy characterize this CMM, which can be installed flush with the factory floor and is equipped with walkable way covers as standard. Air-bearings for both the Y- and the Z-axes are the key to a high performance measuring solution. In the dual arm configuration, the measurement volumes of the two horizontal arms overlap by 100mm to allow full cross-body measurements.